Tens of thousands of Spaniards took part in a “citizens’ tide” against austerity on Saturday on the 32nd anniversary of an attempted Falangist coup. 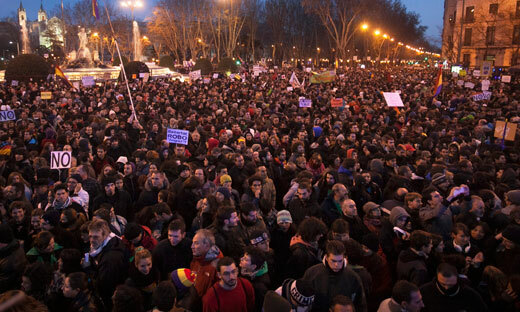 Organizers said Mariano Rajoy’s government was carrying out a “financial coup” against the people. They picked the date to mark the February 23 1981 attack on the elected parliament by Francoist remnants in the armed forces. There were marches and rallies in around 80 places across Spain and as far afield as Las Palmas in the Canary Islands. Protesters dressed in different colours according to their economic sector – white for health, green for teachers, black for civil servants and so on. But in addition to anti-cuts placards, demonstrators also carried banners and wore shirts highlighting corruption claims against Mr Rajoy and his ruling Popular Party. Construction worker Luis Mora pinned envelopes marked “€20,000” to his shirt in reference to the cash payments allegedly made to PP bosses by building bosses. A corruption scandal has also hit the royals, with King Juan Carlos’s son-in-law Inaki Urdangarin questioned by a judge on Saturday about claims he fraudulently diverted charitable donations for personal gain. Newspapers have suggested the payments the Duke of Palma and his associates handled may have exceeded €6 million (£5.2m). Saturday’s protests were largely peaceful but police said today they had arrested 45 people, including nine minors, during overnight clashes. And they said that they found material used for making molotov cocktails abandoned in a backpack. This article was originally posted on Morning Star.